Home » Articles » Ready for Camp? Determining if your child is up for the adventure. Be it day or sleepaway, going to camp for the first time is a big step for a child. Camp is a supportive community where kids gain self-confidence, learn life skills and try new activities. 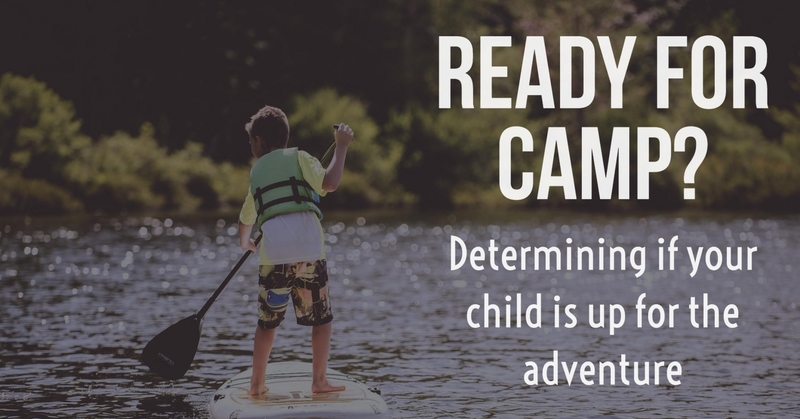 To assess whether your child is ready for the experience, the American Camp Association suggests contemplating several criteria. Factor in your child’s age. Often a child’s first experience away from home, day camps are designed for children 3 years and older. As kids return home each late afternoon of day camp, it’s a wonderful step toward independence. Generally, children attend sleepaway camp starting at age 7. However, just because a child reaches a certain age doesn’t necessarily mean that he or she is ready for sleepaway camp. Use the past as a tool. Think about past sleepovers and playdates. Has your child been successful when away from home? If your child felt panic stricken and needed to come home in the middle of the night, sleepaway camp might have to wait. Parents should keep in mind that even if a child’s close friends are going to sleepaway camp, the child is not necessarily ready. Make sure your child is mature enough for sleepaway camp and self-assured to do certain things independently, such as showering, brushing one’s hair and teeth, and getting dressed. Do some research. Having kids learn about camp allows them to create positive expectations. “The known is comforting to a child so take a tour of the camp, visit the camp cabins, and meet the camp directors,” says Ann Young, owner and director of Camp Hilltop, a coed resident camp in the Catskills. “This will build your child’s excitement about camp while familiarizing them with camp.” Also search for camps online. Check out www.parentguidenews.com where you can watch camp videos and read about summer programs and activities. Take a tour of the camps that appeal to your kids the summer before a they plan to attend in order to allow them to see the place in action. Also inquire about programs like rookie days, which are designed to give prospective campers a chance to try out camp for a few days without a commitment. Reflect on your child’s interest in camp. Does your child talk about wanting to be at camp and camp activities in an upbeat manner on a sustained basis? How much prompting must you do to hear about camp? Camp decisions should be made together. The more involved children are in the process, the more successful the experience is for everyone. Clothing: Ensure your child has swimsuits, T-shirts, shorts, a jacket, sweatshirts, rain gear and dress clothes if needed. Don’t forget sweatpants or other long pants to keep kids warm on cooler days and protect them from poison ivy and bugs bites. Footwear: Stock up on proper footwear for the many activities at camp. Your child might need rain boots, tennis shoes, socks, sandals and even dress shoes. Headgear: Pack baseball hats, bandannas or sun hats for sun protection. Confirm kids have sunglasses and swimming goggles to protect eyes in and out of the water. Bedding: Remember towels for all campers and for sleepaway campers, send a blanket, a pillow, pillowcases, sheets, a sleeping bag, a laundry bag and a mattress pad if such bedding and necessities aren’t provided. Bathroom Essentials: Give sleepaway campers a brush, shampoo, conditioner, soap and a soap container, a toothbrush and a holder, toothpaste, deodorant, insect repellent, feminine products if need be, sunblock, shaving gear and lip balm. Miscellaneous: Other items great for camp include reading and writing materials, such as stamps and stationery for sending mail home, a flashlight and a water bottle. When considering electronics, check with the camp about its policies.